After spotting Marco Polo Sheep, trekking to 4,600m and seeing some of the most awesome starry skies ever, it was time to move on from Keng Shiber. 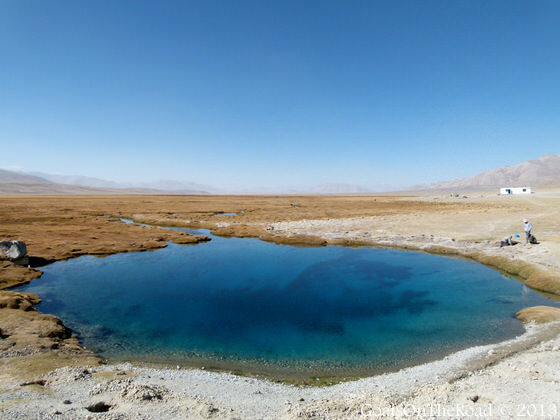 We decided to continue on as planned towards Bulunkul, a stunning alpine lake at 3,734 meters. Waking up in our yurt and peeking out at the golden, sun-kissed peaks of rugged mountain ranges is a great way to start the day. The morning was made even better when Jason brought out his French press and made us all fresh coffee! What a life. Travel comes in different forms. Sometimes we are relaxing in a city or village, sometimes we’re hiking over mountain passes, and sometimes we are constantly on the go. 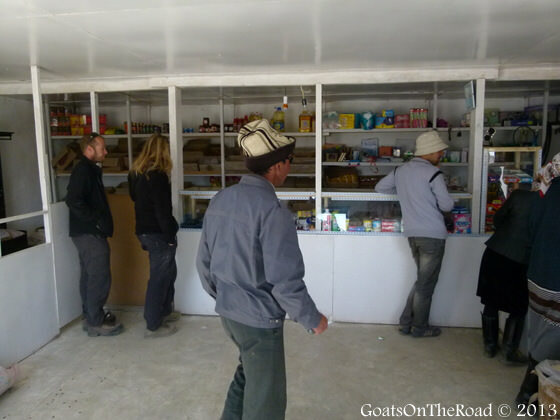 This Pamir trip was a constant adventure, but it was made easy by our friendly driver Nurali, and the fact that we were in such good company with our new friends. 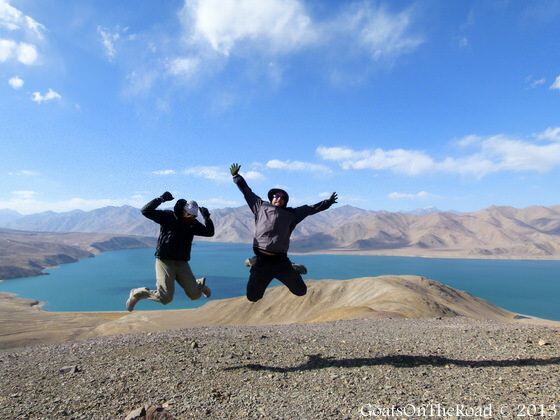 Waking up and not knowing what the day has in store is what our lives are all about sometimes, and this Pamir trip was the epitome of that type of excitement. On the road again! Who knows what today has in store for us?! We packed up the jeep and headed off once again. Today we were only driving for three and a half hours so we had plenty of time to stop where we wanted for photos and videos. 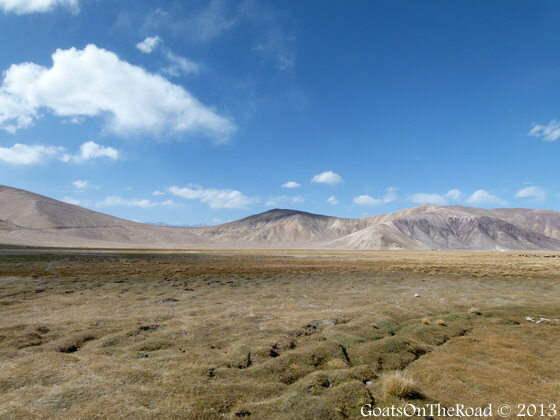 Our Gobi Desert Tour in Mongolia was amazing, but there was far too much driving every day. 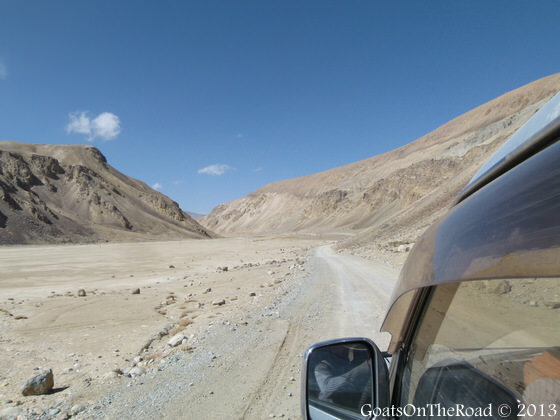 The amount of driving in the Pamirs was perfect and it never felt like a chore because the scenery was always jaw-droppingly gorgeous. Views from the window – now too shabby! As we were driving down the highway we noticed an alluring blue-green pool approaching us on the right side. We told Nurali to stop and we all poured out of the truck to gaze at the tantalizingly clear pool which sat right next to the highway. I readied myself for an icy swim, while Jason and Dariece looked for a secluded place to pee. When Nurali noticed what we were all doing he hollered at us to stop. 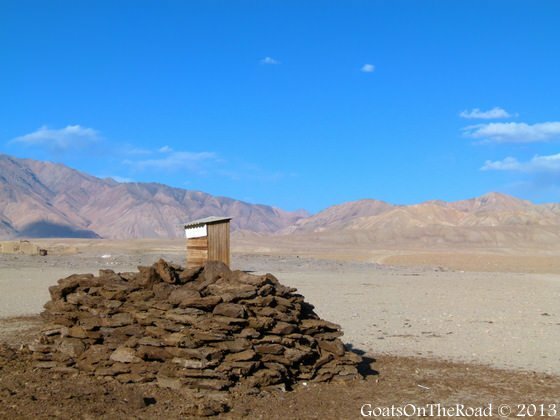 It turns out that this particular road-side spring is a Holy pool, and Jason and Dariece were about to urinate on a holy shrine… oops! We passed through Alichur Village where Nurali visited his sister while we shopped for some lunch food (more noodles and eggs!) After leaving the village we passed by Sassyk-Kul, also known as “stinking lake” for the sulphur stench that escapes its surface. Hmm, what to buy – instant noodles it is! We also passed by Salt Lake which looked like a tiny Dead Sea, with white salt crystals sparkling on its shores. 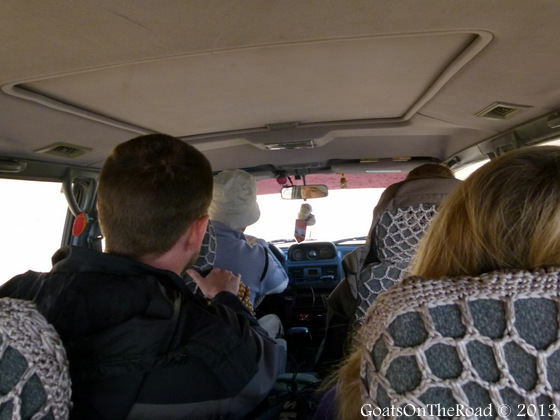 We arrived in Bulunkul around 2:30 and started unpacking the jeep. 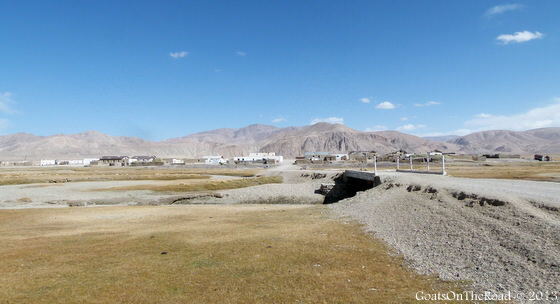 Kul is the word for Lake, and the village of Bulunkul is so named for its proximity to Bulun-Kul lake just a few hundred meters east of the village. 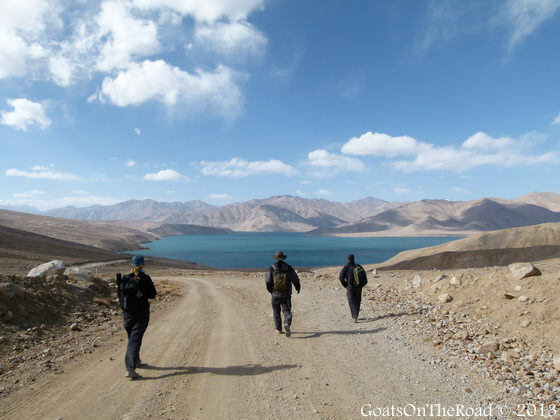 Also nearby is Yashil-kul, another lake which is a popular trek for travellers along the Pamir highway. 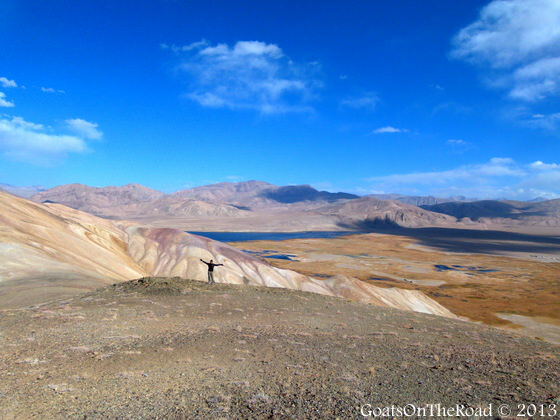 We checked into our homestay and set out on a hike up to Yashil-Kul Lake at 3,734 meters. The pass was only a few hundred meters higher than the elevation of the village, so after reaching the top in just a little over an hour, we felt the need to embark on a more demanding hike. Jason spotted the perfect mountain east of the lake and we joked about trying to climb it in. Before we could decide if it was a good idea, we were all scrambling up the mountainside trying to make it to the top first. The wind picked up as we ascended the mountain and by the time we reached the top it was howling at us from all angles. We weren’t the first people to take on this hill as there was already a pile of rocks on top, which we promptly added a new stone to. The views from the top of the hill were amazing. 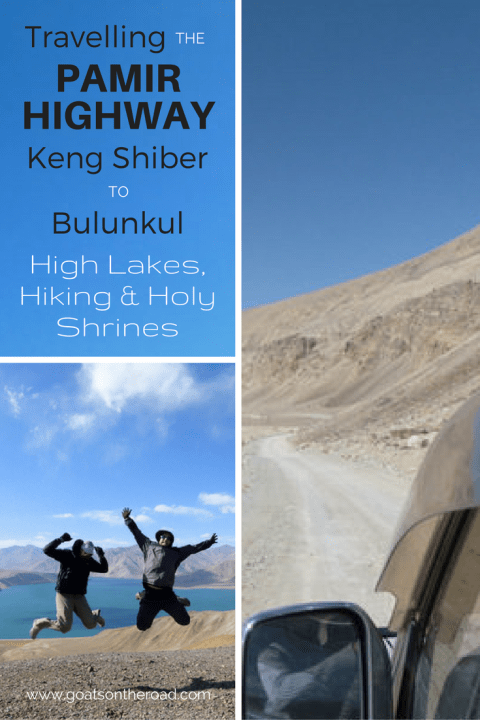 We could see for miles in all directions and the vantage point gave us a better perspective on Bulunkul village, Bulunkul lake and Yashil-kul. Both lakes sparkled turquoise in the afternoon sun and we enjoyed the views for about a half hour before beginning our descent. We made it to the top…Dariece has no head though! We didn’t want to just go down the same way we came up, so we plotted another route down the steep valley on the southern end of our now-conquered hill. The way down was quick and slightly dangerous as we all skied freely down the mountainside. The entire trek took us just a little over three hours and soon we were back in the village. 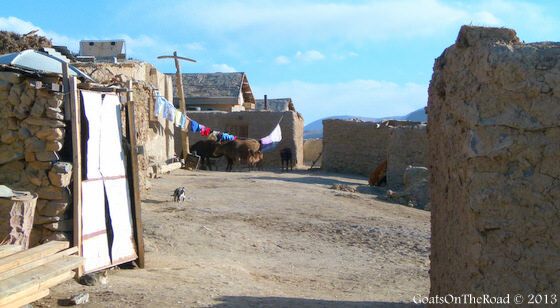 Bulunkul village is just a small scattering of mud homes set in a flat basin of ochre desert. 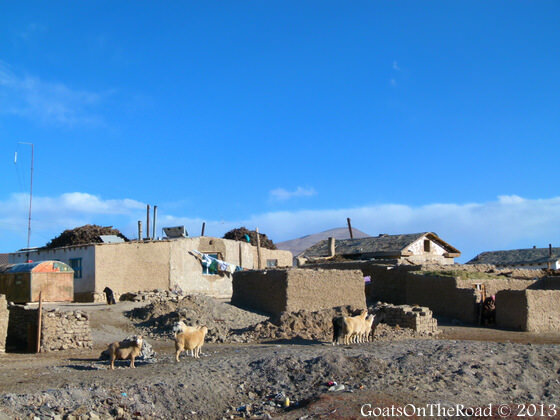 We wandered around the village as the sun dipped low in the sky, illuminating the mud homes with a golden-red hue. The villagers herded their donkeys, sheep and cattle back into their pens as the icy cold evening wind returned to the valley. 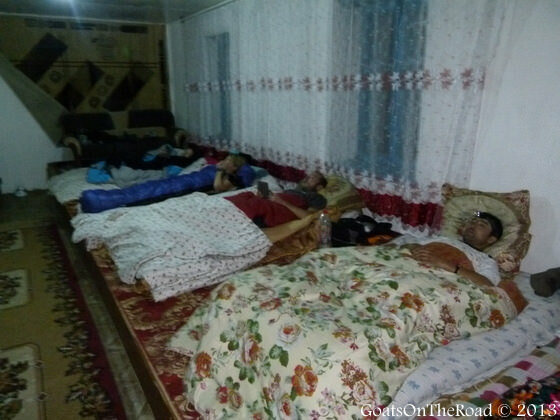 Bulunkul is known to be the coldest place in Tajikistan, but we retreated safely to our cow-poo fire-heated homestay. We enjoyed a delicious home-cooked vegetarian meal and a long chat with our new friends. Just before bedtime, Nurali announced that he would be sleeping in the same room with us. He then also announced that he sometimes talks in his sleep. “okay, no problem” we told him. And then he admitted shyly, that he also cries in his sleep. Goodnight Nurali, no crying please! Confused and a little worried of what we would hear in the night, we turned out the lights and read our Kindles while the wind howled outside. Nurali made it through the night without sleep-weeping, but we did hear him holler a couple of things around midnight. A smile creased my face as I peered out the window of our tiny homestay at the impossibly bright stars twinkling in the sky above. I couldn’t help but wonder what tomorrow would have in store for us. 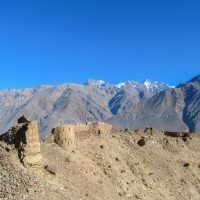 What do you think of our Pamir adventures so far? Think it’s something you would like to do? Share with us below! Hi! 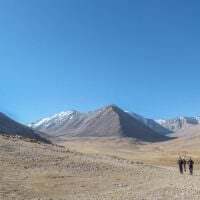 I’m travelling to Kyrgyzstan and hopefully Tajikistan as well, but I would like to know, how much did you pay the driver for the journey through the pamir highway?